A BBC team has entered a remote region of Russia normally closed to foreigners that produces almost half the world's supply of palladium - a precious metal vital for making catalytic converters. But, as the BBC's Richard Galpin reports, it is accused of being the world's largest producer of acid rain. It took more than two months for the Russian authorities to grant us permission to travel to the secretive Siberian city of Norilsk. For decades it has been closed to foreigners (only briefly opening up in the late 1990s) because it is deemed to be a strategic region. It was once ringed by silos containing intercontinental ballistic missiles. But nowadays it has something else it wants to hide from the rest of the world - chronic pollution. From a distance it looks like a front of bad weather moving in and obscuring the otherwise pristine Arctic sky. But drive closer and the source of the long streams of "cloud" flowing over the city and far beyond becomes clear. 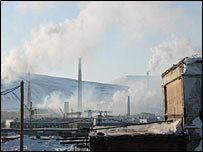 To blame are the clusters of huge chimneys at three smelting plants which surround Norilsk. Twenty-four hours a day, seven days a week, the chimneys pump out a toxic cocktail of pollutants which the company responsible openly admits is mostly sulphur dioxide. Once in the atmosphere this gas turns into acid rain. The company Norilsk Nickel - currently worth about $34bn (£17bn) - also admits that other pollutants including heavy metals are being pumped out, though in far smaller quantities. "In the summer the winds change and often the gas falls onto the city," says local cameraman Andrei Razdevilov. "It's felt by everyone and it becomes difficult to breathe." Norilsk Nickel, which owns the smelters and all the nearby mines containing the precious metal ore, allowed us into the largest of their smelting plants, which they call "Hope". Built in the late 1970s, it is the most modern of the three plants. The oldest dates back to the 1930s, when the metal industry and Norilsk were built from scratch by prison labourers - victims of Stalin's brutal Gulag. The inner sanctum of "Hope" is a deafening, choking cauldron. Vast furnaces roast the ore extracted from the mines, eventually disgorging streams of red-hot liquid metal into containers that dwarf the workers standing nearby. A rich mix of metals is produced here, including nickel, copper, palladium, platinum, gold and silver. But the ore also contains a large amount of sulphur. "Nine hundred thousand tons of sulphur dioxide is emitted by this plant," he told me. "That is the amount agreed with the government." According to figures provided by the company, the total amount of sulphur dioxide produced by all three plants is almost two million tons a year - a figure which has only decreased by about 16% since the last days of the Soviet Union in the late 1980s. The environmental organisation Greenpeace Russia says the pollution has created a 30km (19 mile) "dead zone" around the city and quotes scientists as saying the acid rain has spread across an area equivalent in size to Germany. We drove to one of the woods just outside Norilsk to see for ourselves what has happened. 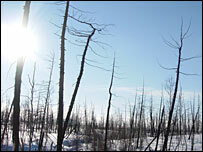 We soon found many trees which were either dead or dying. According to local residents the evidence is even easier to see later in the year. "Things start to grow green then," Doctor Svetlana Golubkova told us. "But the gas cloud goes over and they die." Even more worrying for her is the impact on the health of the population, particularly children. She says she has detected a clear trend. "In the 1960s a lot of people came here and they were all healthy. But now there are very, very few healthy children being born here and that is all because of the environment." She's worried about her own teenage daughter, who has eye problems, and wants her to move to a different city. But for the company Norilsk Nickel, which employs most of the city's workforce, there is a huge amount of money at stake. It is the world's largest producer of both nickel and palladium. It made more than $2bn net profit in the first half of last year alone and company officials told us there is enough ore in the mines around Norilsk to keep them in business for at least another 30 years. The deputy general director of Norilsk Nickel, Tav Morgan, told me the company accepted responsibility for what had happened to the forests, but insisted they were taking action to cut the pollution. "For the period up to 2015-2020 we expect to reduce sulphur dioxide emissions by approximately two-thirds," he said. "Looking at the pace we're resolving these problems you can compare it favourably to other facilities worldwide." But he later admitted it was hard to guarantee this pace of reduction because he said they were still developing the technology. Environmental groups such as Greenpeace are deeply sceptical. They say the company faces the significant problem of what to do with the huge amounts of sulphur which will remain if it is not burnt off. Transporting it to world markets is difficult because Norilsk is located in such a remote Arctic region. Environmental campaigners are also wary because they say there is a lack of independent scrutiny of the amount of pollution created by the company.